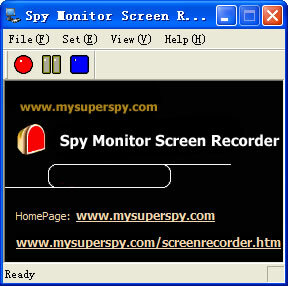 Spy Monitor Screen Recorder software, a computer screen recorder and spy monitor software. This screen recording software allows secretly capturing screen activities and mouse movement on your computer into WMV or AVI files uninterruptedly or scheduling your recordings as you fixed; or you can choose to capture specified screen activity which is useful and important to your monitoring target. How to capture screen to be video undetectable? Spy Monitor Screen recorder is just like a desktop camera. Every desktop and cursor activity, including keystroke typing, some window or program opening or closing, website browsing, IM chatting and all other PC activity will be captured and all of these can display incessantly in the video recording files just like a movie. With this screen recorder monitor, you can view clearly what others do on your computer when you are away; or you can know what your employees do at their working hours. For more invisible monitoring, this screen recording software was made in hidden when it works. There is no trace in Add/Remove Programs, Start menu, Application, and no icons or shortcuts in the desktop or right lower corner of the screen. So Spy Monitor Screen Recorder also is a surveillance camera to monitor incorrect computer activity of the employee, the child or cheating spouse. Key Features of Spy Monitor Screen Recorder: 1. Auto run and record with windows startup; 2. Record screen video into WAV or AVI files as your require; 3. Record screen activity uninterruptedly or schedule the recording as fixed; 4. Record specified screen activity aiming to fixed desktop activity to optimize the recording and reduce space use; 5. The format, frame rate, quality, saved time of the video files can be adjusted to best performance; 6. Easy to use and hotkey setup for start, pause and stop screen recording; 7. Invisible / stealth work with spy mode; hotkey activation, access password protection, hidden program main window. Company: Keylogger Spy Monitor ,Inc.